Here is the flipchart from my talk “Confessions of a Change Agent” at Agile Rock conference in Kiev. Click for a zoomed in version. Here are the slides from my agile intro at KTH last week. Hope you enjoyed it! As climate scientists have long predicted, the world is experiencing a record amount of extreme weather events – droughts, hurricanes, wildfires, flooding, heatwaves, and extreme cold. Wildfires in Santa Rosa Californa, Drought in Somalia, Extreme cold in Chicago, Hurricane Harvey in Houston. It’s hard to prove if any specific disaster is due to climate change, but that’s not important. The key point is the overall trend: climate change increases the frequency and severity of extreme weather events, and it’s happening really fast. This also creates climate refugees, political instability, and increases the risk of war. Basically, the world is becoming a less and less safe place to live. The bad news is this will most likely keep getting worse over the next few decades – even if we were to completely eliminate all CO2 emissions right now. Climate change is like a huge flywheel that we’ve set in motion over the past century, and even when we stop spinning the wheel it will keep going for decades or more, due to inertia. OK here’s an offer to any conference organizer in the lean/agile/tech/climate space. I get a lot of requests to do conference keynotes, which I’m grateful for, but unfortunately I have to turn down the vast majority. I limit long-distance travel for family reasons, and also for climate reasons (although I confess I’m in Thailand right now as I write this…. hard to be 100% consistent…). Now I’m thinking: Why should something as mundane as physical transport get in the way of participating in a great conference? And, in this world of catastrophic climate change, shouldn’t most business trips be replaced with remote participation? My hypothesis is that it’s possible to remote-participate effectively in a conference – to do a keynote or talk, participate in workshops, even hang out with people in the hallway. I’ve tried this a few times using video conference and telepresence robots. In fact, 4 years ago I was sitting on this same beach in Thailand, remote-participating in a Spotify event in Stockholm using a Double (see “What it feels like being an ipad on a stick on wheels“). That was fun and a bit clunky, but it was 4 years ago so I bet the telepresence robots have come a long way since then! The most obvious minimum first step is to eliminate your own personal carbon footprint, and become climate neutral! Think of the First Rule of Holes: “If you are stuck in a hole, stop digging!”. Climate Change is the biggest hole in the world and we all need to stop digging right now. Going climate neutral yourself obviously doesn’t solve the whole problem, but at least you’ll stop adding to the problem. And the more people who go climate neutral, the more we slow down climate change. And since we are in Christmas season: going climate neutral is the best possible christmas present you can give to the world! The effects are long-term, so it will probably be your kids and grandkids who benefit more than yourself. But I think we owe it to them, and they will definitely hold us accountable some day. Leaving a habitable planet to the next generation is really a minimum sign of courtesy, wouldn’t you say? Got questions? Check the FAQ. Spread the word! The more people who sign up, the bigger impact we can make. If you want to go climate neutral, but you prefer other means than our service, that’s of course just as fine! I suggest you sign the Zero Carbon Manifesto and then inspire others by telling them how you are doing it. If you want to learn more about climate change, check out my other video Friendly Guide to Climate Change. Is train a feasible alternative to flying? 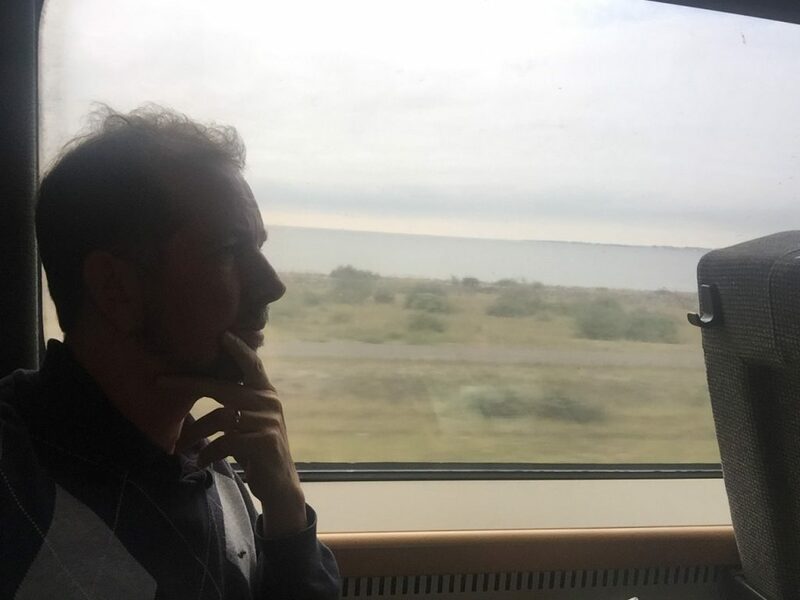 As I write this I’m sitting on a train headed back to Sweden, pondering the result of a year’s experimentation with travelling by train instead of flying. Is this an effective way to reduce my carbon footprint? The jury is in! Read on. One common rallying cry among climate advocates is to fly less (or ideally not at all). I consider myself a climate advocate (here’s my entry ticket), but I’m also a pragmatist. I’ve worked enough with behavioural change to know that it’s unrealistic to expect many people to change their habits unless there is a convenient and compelling alternative. For example, Spotify killed music pirating, not by attacking pirate sites, but by providing a better and more convenient alternative. So what are the alternatives to flying, if you want to get from A to B? Option A: Don’t go. Stay at A. This option won’t fly (pun intended) with most people. There’s a reason why they want to go from A to B, and only a small number of people will be willing to sacrifice that (kudos to those people though!). Option B: Walk or bicycle. Not feasible. A distance that is long enough to take a flight is usually waaay too long for a walk or bicycle ride, unless you are an enthusiast with LOTS of time on your hands. Option C: Car. This makes sense only if you travel in a group, or if you drive an electric car. If you drive alone in a fuel car, the climate impact is about the same as flying, just takes longer and is more dangerous and clogs up the road. Option D: Bus. I haven’t found any long-distance bus options to the places I go. Might be more feasible in other countries than mine. Option E: Train. Is train a feasible alternative? Definitely climate friendly, but what about price, convenience, reliability, and time? Read on! For years I was hearing an increasing murmur and rumours about some kind of problem with the ship. Finally I decided to take a closer look, went up to deck, leaned out and looked down, and…. oh sh*t…. this ship is sinking! It’s tilting, some cabins are already flooded, with people frantically crowding the hallways and staircases trying to get to higher deck. It’s happening slowly, very slowly. In fact, the ship won’t be completely sunk during my lifetime probably. But my kids, and grandkids…. Darn! The obvious question then is – HOW do you carbon offset? I was surprised when I dug into it. “Traditional” carbon offsetting (buying emission credits and things like that) seems pretty useless! I couldn’t find any credible evidence that it makes a real difference! Almost like a scam. So is there another way to carbon offset? Yes! This chart summarizes some of what I’ve learned so far. Read on for details. Got any more suggestions? Add comments. But please quantify. 10 years of Agile @ Crisp. Next challenge: Global Warming! 10 years ago, 2007, me and a few Crisp colleagues embarked on a mission: be best in Sweden at helping companies become agile. We had experienced first-hand the power of agile development, and wanted to use this newfound super-power to help both Crisp and our clients improve. Others joined us and – tadaa! – Agile Crisplet was born (and the concept of crisplets)! That was the year I taught my first Certified ScrumMaster course together with Jeff Sutherland, co-creator of Scrum. Since then we’ve co-trained almost 30 courses! About 2-3 times per year. In fact, May 22-23 is our 10 year anniversary (join us at the course in Stockholm!). Now 10 years has passed since our Agile Crisplet was formed, and I’m happy to see we have achieved more than we ever could have dreamed! Dispensing with false humility here, we’ve somehow managed to become one of the world leaders in this field! Famous agile and lean experts partner with us. Super well-known product companies, large telecoms and banks, even government organizations, turn to us as first choice for agile guidance and training. Our videos and articles and books have racked up millions of hits, and we are basically overwhelmed with requests to do coaching, write book forewords, do conference talks and workshops, and run training courses. I’ve done almost 30 keynotes in 20+ countries. I’m amazed (and overwhelmed) every time I look at my inbox, I’ve had to hire an assistant just to turn down the 95% of all requests that we simply don’t have capacity to handle. 10 years is a long time, and now it’s time for a new focus! At least for me (Crisp is a no-CEO company where people are free to do whatever they want). Here are the slides from my keynote Agile Everywhere at Agile Tour Montreal. In the keynote I shared my experiences from applying agile in lots of different non-software contexts. Enjoyed the trip! After the conference I spent a day at Ubisoft Quebec to discuss REALLY large-scale agile (like 1000-person video game projects). I see more and more companies applying agile at really large scale and my key takeaway is that, the larger the project is, the more important the agile principles are. For tiny projects any process can pretty much work. Also interesting to see how different types of organizations – such as video game development, banking, and aerospace – arrive at very similar patterns for how to deal with dozens or hundreds of agile teams building a product together. Just keep in mind that big projects are super-risky with or without agile, so your first priority should be to de-scale. Anyway here are some sample pictures from the keynote.